In October 2007, The Late Show With David Letterman requested that I be one of five life coaches to work with anxiety-ridden comedian Andy Kindler. Read my blog for a more detailed account of the experience. Below is the segment that aired on January 24th, 2008. Fun fact - then Senator, Barack Obama, was the main guest that evening. 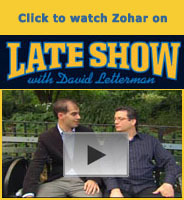 Be sure to check out the many more instances of Zohar in the news.